The colonial state strikes again. 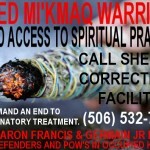 State repression against and the targeting of Mi’kmaq Warriors has escalated. 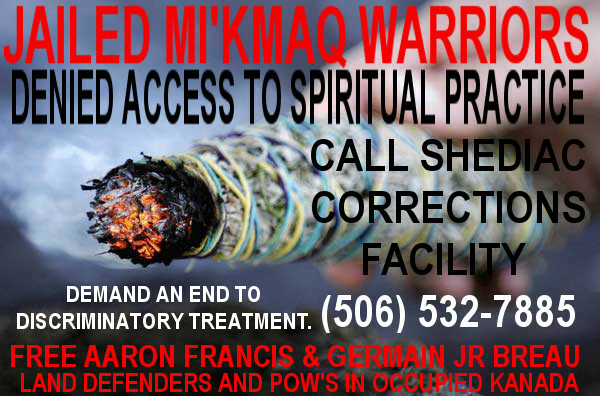 The state is now denying 2 Mi’kmaq Warriors, Aaron Francis and Germain Jr Breau, access to spiritual practices. Aaron and Jr have been held in Kanadian custody without trial since the raid on Oct. 17th – just over 3 months. With your help, Junior was released from solitary confinement! Together we can make our voices heard. Flood the phones and let the jail know that the Warriors’ have support and this treatment must not continue!